Phone And Absentee Bidding Also available. 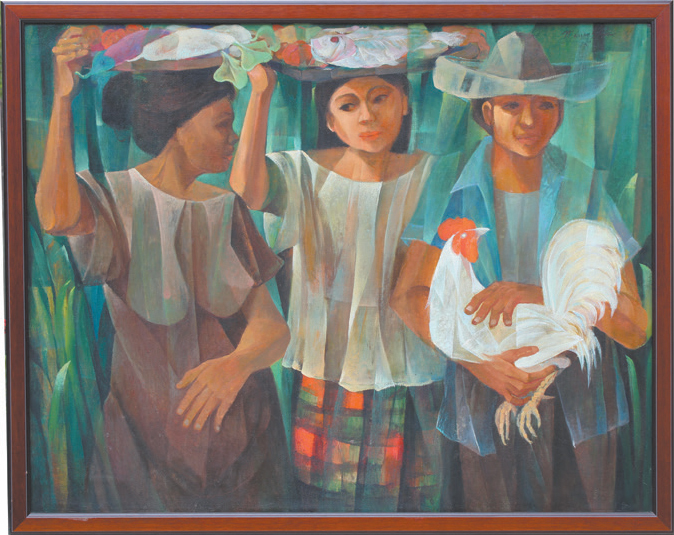 Vicente S Manansala (Philippines, France, 1910 – 1981) Painting depicting three figures with various fish, chicken preparing for dinner. Oil on board. Signed and dated upper right. Sight Size: 35x 44.5 in. Henri Joseph Harpignies (French, 1819 – 1916) “Barbizon Landscape” Signed lower left. Oil on Panel. Sight Size: 14.25 x 19.25 in. Monumental Large Framed Antique Tibetan Thangka. Overall Size: 70.5 x 43 inches. Mai Thu (Viet Nam, France, 1906 – 1980) “Grand-Mere Et Petits Enfants”. Ink and gouache/silk. Sight Size: 6 x 4 in. “The Judge” Theodule Augustin Ribot (France, 1823 – 1891) Oil on cradled panel painting of figures in an interior setting. Exhibition labels verso. Signed lower right. Sight Size: 17.5 x 24.5 in. Collection of Fine Japanese Meiji Period Porcelains. 18th century painting of the “The Death of Germanicus”. Oil on canvas old master painting. Sight size: 26.5 x 37.5 in. “Oriental Beauty” Adam Styka (New York / Poland, 1890 – 1951) Signed lower right. Orientalist oil on Canvasboard. Sight Size: 23.25 x 15.25 in. Large Pair of Chinese Cloisonne Foo Lions on Stand. Overall Dimensions: 25 x 14.5 x 20 inches. Benedict Masson (French, 1819 – 1893) Monumental painting of a young woman with a garland of flowers. Oil on Canvas. Signed lower left. Sight Size: 36 x 28.5 in. William James Glackens (Pennsylvania, New York, Connecticut / France,1870 – 1938) Still life painting. Signed lower right. Oil on canvas. Sight size: 19 x 23.5 inches. Henry Rankin Poore (Pennsylvania, Connecticut, 1859 – 1940) Important Large painting titled “Arcadian Hunt”. Oil on canvas. Signed and dated lower left. Sight Size: 28 x 51.5 in. ”Near Cader Idris North Wales” Alfred Glendening. Signed lower left. Oil on Canvas. Sight Size: 19 x 29 in. Domenico Caligo (Florence Italy, fl. 1862-1880) An artist in the Salon de Jupiter, Pitti Palace, Florence. Watercolor. Signed lower left. Sight Size: 16 x 22 inches. Large Antique Tibetan Gilt Bronze Figure of Padmasambhava. Height: 12.5 inches. William Henry (American, 1890-) “St. Augustine, FL” Watercolor. Signed lower left. Sight Size: 21 x 27 in. Chinese Multi-Color Porcelain Cabbage Form Vase. Large rare Qing Dynasty Jiaqing Reign (1796-1820). Dimensions: 13.5 x 10 x 11 in. 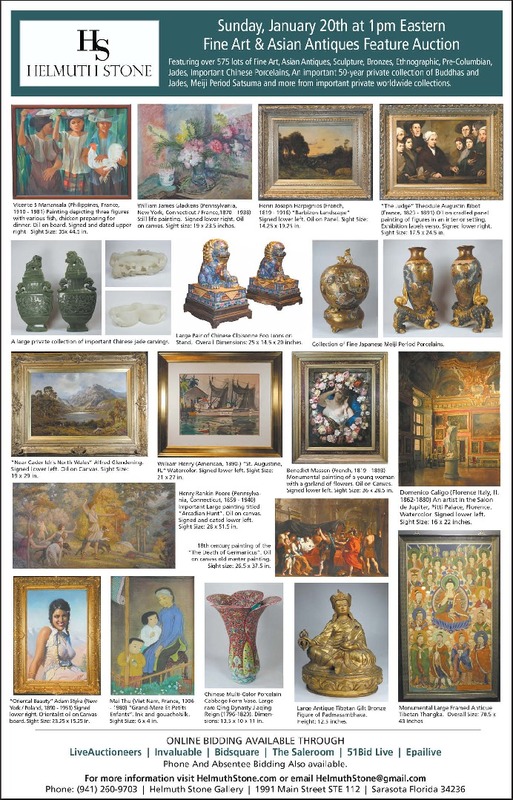 A large private collection of important Chinese jade carvings.